Disclaimer: I received this product as a sample to test and review for this blog post as well as an additional product to giveaway to one lucky reader. All opinions are honest and my own. I don't know about your kids, but Grace is hooked on electronic gadgets. I saw it right away when she was a baby. She would pull herself up to the desk and try to use the mouse of my old, clunker of a desktop computer. (My current laptop is a clunker, too!) Even now, if I walk away from the desk, I'll catch her typing her name on the keyboard. Mostly, though, anything with a app catches her attention. I was recently asked to review an InnoTab 3S Plus Learning Tablet by VTech and with the holidays quickly approaching, I figured it was perfect timing! Especially since they are allowing me to give one away to a lucky reader! The recommended age group is 3-9 years and the suggested retail price is $79.99. The InnoTab 3S Plus is a value-packed 5" tablet that features a rechargeable battery power pack so you don't need to worry about constantly purchasing batteries, a cost that really adds up. This tablet offers access to more than 800 educator-endorsed, age and stage appropriate cartridges, software and apps that can be purchased and downloaded from VTech's Learning Lodge app store. InnoTab 3S Plus features Wi-Fi and comes with 16 apps, including free access to an enhanced 2nd generation of VTech Premium Kid Connect, a tablet-to-mobile communication app that lets kids communicate in real time and exchange voice and text messages, photos, drawings and fun stickers with their parents' smartphones. Children will also love taking photos using the 180 degree rotating camera with over 55 special effects and using the video recorder for movies. They can even import and listen to their own MP3s with the music player. As I expected, Grace really loves the VTech InnoTab 3S Plus and just like our iPhones, we have to limit her time otherwise she'll want to use it during dinner! She won't tell us what her favorite feature is, but I suspect it's the 180 degree rotating camera! Also, she loves that she can send her daddy text messages when he's working late or on the weekend. We love that it's helping keep her interested in learning! 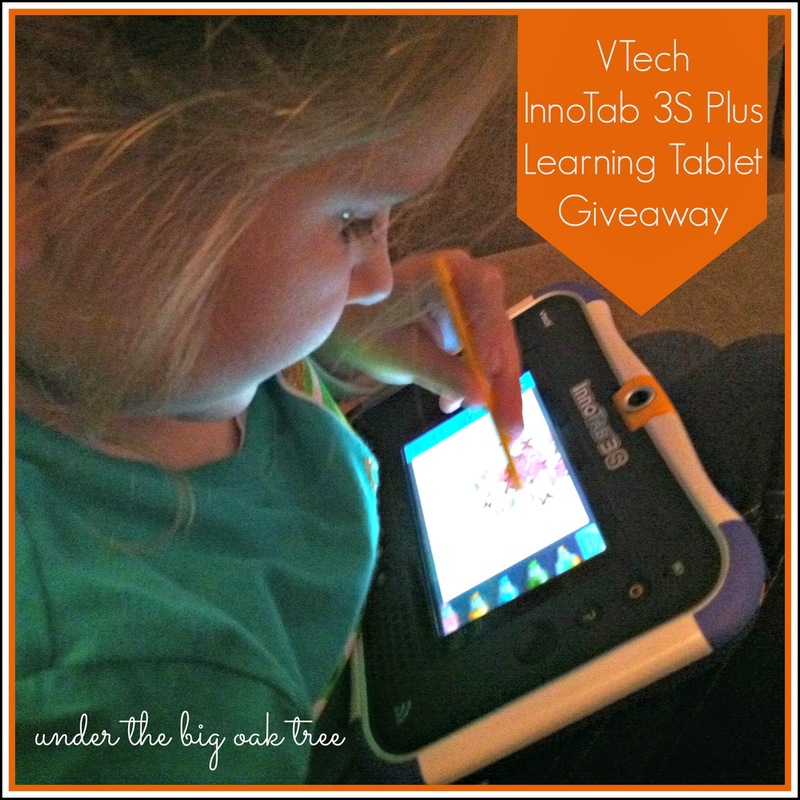 Would you like to win a VTech InnoTab 3S Plus Learning Tablet? Use the rafflecopter form below. Winner will be selected using rafflecopter.com Winner will be notified via email and will have 24 hours to respond with their shipping information which will then be forwarded to the sponsor. US residents only, please. I would give this to my grandson! He would enjoy it! By little guys would love the Innotab! I would give it to my youngest child. Thanks for the chance. My 4 year old would love this. I would give it to my 3 and 5 year old if I won! I would have Santa give it to my 4 year old daughter - the older ones are getting ipad minis so this would be a great learning toy for her !! I would give it to my daughters. They would LOVE it! Thank you for the wonderful giveaway. I would give this to my niece. I think she would enjoy this.